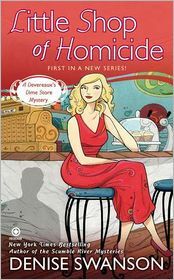 When you hear the name Denise Swanson and think cozy mystery you immediately think of her Best Selling Scumble River Mystery Series featuring school psychologist Skye Denison. Murder of a Creped Suzette, the 14th book in the series, was released back in October. But today she is here to tell us about her brand new Devereaux’s Dime Store Mystery series. Little Shop of Homicide was released on March 6 and it is a wonderful debut but I ‘ll post my review after we visit with Denise. Pour a cup of coffee and let’s hear how Devereaux Sinclair’s life was born onto the pages for all of us to enjoy! Hi Everyone, I am happy to be here. It took me a long time to decide to write a second mystery series. I was happy writing about Skye and her gang in my Scumble River series and didn’t really have an idea (at least not a good unique one) for another mystery series. I had lots of ideas for contemporary romances, paranormal romantic mysteries, and even one for a suspense thriller and an end of the world book—all of which I wrote several hundred pages on before having to turn back to Skye because of a looming deadline. However, about a year ago, a character named Devereaux Sinclair popped into my head and started telling me her story. Dev, which is what most people call her, was a financial advisor for six years before buying her hometown dime store. Her boss viewed the glass ceiling as a protective barrier and her colleagues committed most of the seven deadly sins before their first coffee break. Dev lives in the fictional town of Shadow Bend, Missouri with her grandmother, Birdie. With her father in jail for vehicular manslaughter and her mother hiding in California, Dev has no other family. She does have two best friends—a cynical bad girl named Poppy Kincaid who owns Gossip Central, the local bar, and Boone St. Onge a small-town lawyer who handles the local divorces and real estate deals. When I realized I finally had an idea that was sufficiently different from Skye, but still with enough similarities to make me want to write about it—small town setting, quirky family and friends, and murder—I decided to give it a try. The Devereaux’s Dime Store books offer me a chance to spread my wings and write about some edgier situations, while still keeping my same voice AKA writing style. My goal is to continue to give my readers a satisfying mystery, but add a tiny bit spicier romance and more complicated family relationships. Not to mention, the nostalgia that only an old fashion dime store can truly provide. In a way, it’s like having a second child. I wanted to do all the things that I had done right with the first series, but try some new things as well—and avoid some of the mistakes. And while I love my first-born, and am continuing to write about her adventures, (the next Scumble River comes out in September) I also love Dev and her town and I hope you will, too. Denise, I am so glad Dev popped into you head along with all her friends. As you will see below I LOVED this story!! Welcome to Devereaux’s Dime Store and Gift Baskets complete with a 3 stool soda fountain and a glass candy case. The best thing Dev ever did was quit the rat race, move home and buy this store. Today she is rethinking her big decision as Kansas City Detective Woods arrives before the store is even open to accuse her of murdering her ex-boyfriend’s fiancée Joelle Ayers. Just because some items from a gift basket she created were used as murder weapons didn’t mean she had anything to do with the woman’s death and he surely doesn’t have enough evidence to arrest her. He makes a few threats and leaves. Panicked Dev gets her friends Poppy and Boone to help her investigate. Then, hunky Jake Del Vecchio, a U.S. Deputy Marshall in town recovering from an injury, enters the picture. Seems his uncle and Dev’s grandmother are old friends and he has been encouraged to help her clear her name. Only one problem, this guy Jake is hot, and Dev is finding it difficult to concentrate on finding the real killer. If she is not careful to keep her mind on the tasks at hand she may find herself doing time behind bars instead of behind the counter of her five-and-dime. I keep breaking my own rules. I used to say I couldn’t give the first book in a new series 5 stars because it takes time for the characters to develop. However, I started this book and couldn’t put it down. The characters, while new, grabbed my heart immediately. The romantic tension was fabulous, a new twist to the typical cozy and I think it is wonderful. Plus the small town setting and the dime store evoke memories of a store from my childhood, a place I adored and drank quite a few cherry cokes. Denise Swanson has created a marvelous debut for this new series. The mystery is top-notch, with several twists of its own. She has taken a small risk adding a bit of spice to the romance and this reader absolutely loved it. These are characters I am invested in and I can’t wait to tag along on their journeys. Bravo Denise!! I have 2 copies of this book to give away!! Leave a comment for Denise for 5 Bonus Entries ! This book has been on my wishlist. Thank you for the giveaway. Sounds like a great new series. Thanks. Love cozy mysteries and already have this one (and others) on my wish list. Looking forward to reading. Thanks for stopping by to chat and share with us Denise. Loved Skye when i first met her and I am sure I will love Dev. Can’t wait to read this. I just discovered cozy mysteries about two years ago and I am in love with them. Each new series I discover is more enchanting, so I can’t wait to try this one. Thanks. Denise, this sounds like a great series, putting this on my wish list. Lori, thanks so much for inviting me to your blog! I’m thrilled to have the chance to introduce Dev and Shadow Bend to your readers. Thanks also to Wendy, Linda, Nancy, MissKallie, Becky and Lisa for your comments. I could definitely see myself with this cozy mystery sitting outside in the fresh air. I’m intrigued by the idea of the Dime Store. Woolworth’s closed when I was in my teens and the .99 cent stores that replaced them just don’t measure up to that memory. My library doesn’t have the book on their shelves yet and I’d love to be able to win one for myself. Lauren–it’s 82 here in Illinois today so a perfect day to be sitting outside with a book. Nora-Adrienne–Hope your library gets it soon. I love to start a new series right from the beginning, then wait with anticipation until the next book comes out. And I like the idea of the dime store setting—good memories from my childhood of the local dime store. Sue, I’m with you. I always want to read a series in order. That’s why I’m so thankful that my entire Scumble River series (all 14 books) are still in print and easy for readers to obtain. 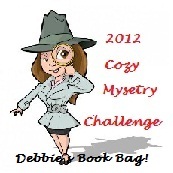 I love cozy mysteries! Your new series is now on my TBR list. thank you for the giveaway. we really appreciate it. I love to sit with a good book and relax. I am so excited about Denise’s new series. It’s the next book on my to-read list. Can’t wait!! Thanks, Dina, Ruth, and Linda! Thanks, Carol! My hometown had a five and ten called Hornsby’s We all were really sad when it closed. This looks like a fun new series. Dev, Poppy, and Boone sounds like interesting characters. Thanks for the giveaway. Denise you got me hooked on cozies! you are still my favorite cozy author! Thanks, Margie. I love all the new characters. The reviews everywhere have been wonderful! It’s already on my wishlist. Welcome Denise! I have been a big fan of Scumble River for a long time and can’t wait to read the first book in your new series! It sounds fantastic! I worked at a Woolworth’s as a teenager, though by then it had more of a K-mart feel. I did love the soda fountain area and remember it fondly. I love Skye, and now I love Dev, too. Wonderful book!!! As I am currently doing a mystery month challenge I’m getting quite hooked on them. This one sounds good I would love to add it to my list. Thanks! This book looks really great, I would love to win. Thanks for the chance. Wow! I step away from the computer for an evening and come back to all these wonderful posts. Thanks so much, Orchid, Victoria, Ann, Karen, Gloria, Andrea, and Margaret for considering my new book. And thanks holdenj for your years of loyal readership. I hope you enjoy my new series as much as you have the Scumble River books. Heather, I’m sooooo glad you love Dev, too! What could be better than a cozy mystery? And to have a dime store in the series, take me back to my younger life. Every Saturday, my mother would take me and my siblings to S.S. Kresses. We would either sit at a booth or at the soda fountain bar. I would always get a tuna sandwich on toast, chips, dill pickle and a cherry coke. What wonderful memories. I love reading your books and this one sounds like another winner. Thanks Sherree! I’m thrilled that so many others have fond memories of dime stores too. Helen, I hope if you give Little Shop of Homicide a read it will pull you in and make it a race to the finish. This must be a spectacular cozy to get 5 stars when it it first in the series. Really want to read this one. Thanks, Carol! It’s a cozy with a little edge. Sounds like my kind of book, I just love mysteries. Thanks for this chance. Seems like a great book. Would love to read it. Your Scumble River series is one of my favorites. I’m looking forward to this new series now. Ellie, thank you so much. I love hearing my series is one of your favorites. This is truly my kind of mystery. I’m from a small town and I remember characters and places like these before the suburbs sprawled our way. Thank you for the lovely giveaway. Want to leave a note for Denise — the book sounds like such a charming read! That is certainly not meant in a negative way, either! I read quite a few YA paranormal books and find that they get monotonous after awhile and a charming, cozy book is just what the doc ordered. The review was wonderful and I plan to put this book on my Goodread TBR list now! Thanks, Maureen, Cyn, Irene, Patricia, Kandace, and Mary Ann! Redemption Day by Steve O’Brien GODS AND FATHERS Virtual Blog Tour with Giveaway!